Muniba Saleem received funding from The National Consortium for the Study of Terrorism and Responses to Terrorism. On the morning of June 12, as details emerged from a shooting at an Orlando nightclub, Muslim Americans across the country likely reacted with horror, while secretly hoping that the shooter wouldn’t turn out to be one of them. Many had gone through the same roller coaster of emotions after the 2013 Boston Marathon bombings and the San Bernardino shootings. Muslim Americans have become accustomed to this pattern whenever there’s an attack with a Muslim perpetrator. Media outlets will debate whether or not Islam justifies violence, while sounding alarm bells about the extent of homegrown radicalism. At the same time, politicians and pundits trumpet policies restricting the civil liberties of Muslim immigrants and citizens. As a media psychology researcher, I’ve studied how media representations of Muslims fuel anti-Muslim hostility and policies in America. Because so few Americans personally know Muslims, media depictions of them as terrorists are especially potent, leading many to believe that all Muslims are terrorists. Even in coverage unrelated to terrorist attacks, Muslims get a bad rap. Content analyses of Muslim representations in cable news, television and movies, and newspapers reveal that Muslims in American media are overwhelmingly represented as violent, terrorists, barbaric and intolerant. 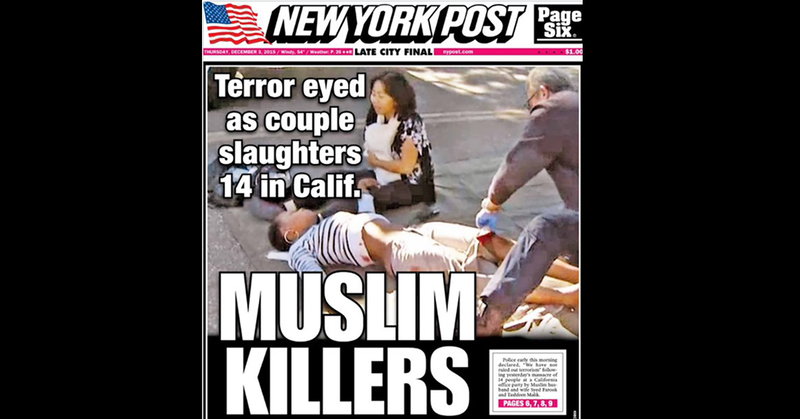 At the same time, there are almost no positive portrayals of Muslims in American media. According to social psychologists, contact with “outgroups” – social groups that we don’t identify with – can reduce prejudices. But when direct, positive contact is limited or nonexistent, studies have shown media representations of outgroups have an even greater influence on our attitudes toward members of those groups. Since Muslims make up only one percent of the U.S. population, most Americans don’t interact with them on a daily basis. This means that what they see on the news will largely influence how they perceive Muslim Americans. In a recent set of studies, we discovered just how influential negative news depictions of Muslims can be. For example, we conducted an experimental study in which participants were randomly assigned to watch a negative, neutral, or positive depictions of Muslims in the news. Next, participants completed questions assessing their perceptions of all Muslims and support for policies harming Muslims. Participants in the negative condition were exposed to a news story discussing the 2007 attempted terror attack on Fort Dix, which was perpetuated by six Muslim men. Compared to those in the other video conditions, these participants were significantly more likely to perceive all Muslims as aggressive and violent. In addition, we were surprised to discover how easily they were willing to impose civil restrictions on Muslim Americans, whether it was making them go through separate security lines at airports, restricting their voting rights, or allowing the government to track them. These participants were also more likely to support military action against Muslim countries – even if civilians would be put at risk – while they also sought to reduce the influence of Islam. It’s important to note that many of the policies supported by participants in our study bear a strong resemblance to those proposed by American presidential candidates during the 2016 election cycle. Indeed, many political candidates have called for increased surveillance of the Muslim American community, potentially closing down mosques, requiring Muslim Americans to register within a database or carry special identification identifying their faith, and banning immigrants from Muslim countries. The fact that many of these proposals are unconstitutional does not alleviate the anxieties and fears of Muslim Americans. Many are aware that similar actions were once taken against Japanese Americans after the attack on Pearl Harbor. On an optimistic note, my research has also shown that media representations of Muslims in a positive light – in addition to direct contact with Muslims – can produce the opposite effect. In the same study mentioned earlier, Americans who were exposed to a news clip portraying Muslim Americans volunteering at a food shelter during the holiday season were less likely to report anti-Muslim attitudes. They were also less likely to support policies that harm Muslims domestically and internationally. In another study (still in press), we divided American college students into two groups: those who said they had direct contact with Muslims, and those who used the media to find out information about Muslims. Students who reported having direct contact with Muslims were less likely to have anti-Muslim attitudes or support anti-Muslim policies than those who relied on media alone for their information. These findings highlight the power of face-to-face contact with outgroups, along with more balanced media coverage. It’s important to recognize that this research does not in any way suggest that media should not report on attacks by Muslims. Instead, this work highlights the importance of fair media representations of the Muslim-American community. After all, there’s plenty of positive news events involving Muslim Americans to report on. There’s the Respond With Love campaign, a project initiated by a Muslim nonprofit to support the victims of the Emanuel AME Church shooting in Charleston, South Carolina. Ibtihaj Muhammad qualified for the Olympics as the first U.S athlete to compete wearing a hijab. (She also trained while fasting during Ramadan.) During the Clean Water for Flint campaign, Muslim Americans delivered water bottles to residents of the Michigan city. And at the first ever Muslim Funny Fest, Muslim comedians used humor to tackle issues like Islamophobia. These stories, unfortunately, don’t get nearly the same amount of coverage as a terrorist attack. Until they do, media coverage of terrorist attacks perpetuated by Muslims will continue to fuel anti-Muslim attitudes and support for policies harming Muslims.